Japan’s ambitious ‘Model Eco-House’ project has already completed twenty unique sustainable homes throughout the country in an aim to set a new national standard for environmental design. At the 34th G8 Summit in Hokkaido, Japan and the other member nations agreed to reduce carbon emissions by 50 percent before 2050. Japan is working to surpass this goal and achieve a truly ’Low Carbon Society’ by reducing emissions by as much as 80% within the next 40 years. A critical component of the plan is to reduce Japan’s households energy consumption which has risen by an alarming 40% since 1990. Therefore, the government has committed itself to improving the overall quality and performance of new and existing homes. 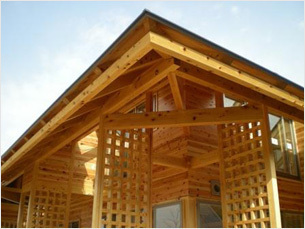 Japan’s Ministry of the Environment established the ‘Model Eco-House’ (環境省エコハウスモデル事業) program to build twenty sustainable homes throughout the entire country. From Okinawa in the south to Hokkaido in the north, the Ministry selected twenty municipalities to each design and construct and operate an experimental Eco-Home responding to the local climate and site conditions. The program aims to build a nationwide bank of knowledge, raise general awareness about environmental design and disseminate environmental construction knowledge throughout the nation. You will find the term ‘Eco’ branded onto a wide assortment of consumer goods in Japan. 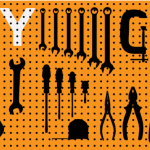 The electronics giants (Panasonic, Toshiba, Hitachi, etc) , who make energy-saving solar panels, Ecocute (heat pump, water heating and supply system), solar collectors, low-energy lighting, air conditioners, as well as most domestic appliances, are well aware that lowering energy consumption is also good for business. These companies are the main beneficiaries of the government’s Eco Point system designed to stimulate Japan’s flagging economy by rewarding the purchase of new electronics to replace older less energy efficient models. 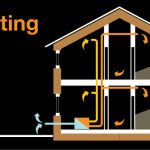 The popular understanding of ‘eco-house’ rests largely on the integration of such gadgetry, but does not extend to the environmental design of the home itself. 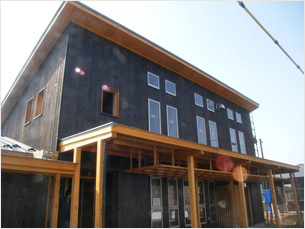 The ‘Model Eco-House’ program set out to change the understanding of the term in Japan. 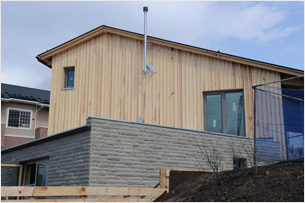 The homes were built to encompass three themes: environmental performance (insulation, air tightness, orientation, shading, glazing, natural ventilation, etc); use of renewable energy sources (biomass, solar, ground source, etc); and finally, the promotion of an eco-lifestyle. 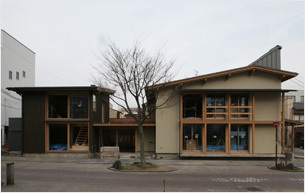 In technology-driven Japan, the twenty completed homes are refreshing in terms of their use of natural materials and passive techniques for conserving energy. Each home has been designed by a different local architect in conjunction with the city governments and the Ministry of the Environment. 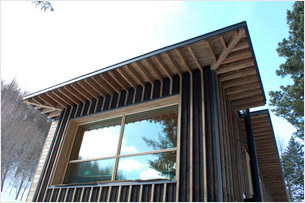 A range of sustainable design approaches is on display. 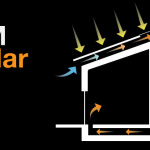 Most are designed to utilize passive solar heating and use natural ventilation techniques to circulate warm and cool air throughout the home. All but one of the projects is constructed from timber — much of which is sourced locally — with the typical skill of of expert Japanese carpenters. None are apparently out to make cutting-edge architectural statements. 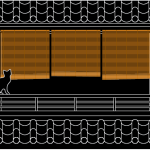 The homes look conventional for the most part, demonstrating the inherent sustainability of many traditional Japanese elements – large pitched roofs, overhanging eaves, generous glazing, and koshiyane doubled roofs. The project home page is rich with details on each house, so rather than presenting each home here, I recommend spending time investigating each project through the interactive map on the project website. Generally, I think the program is a great success, but I have a few reservations as well. 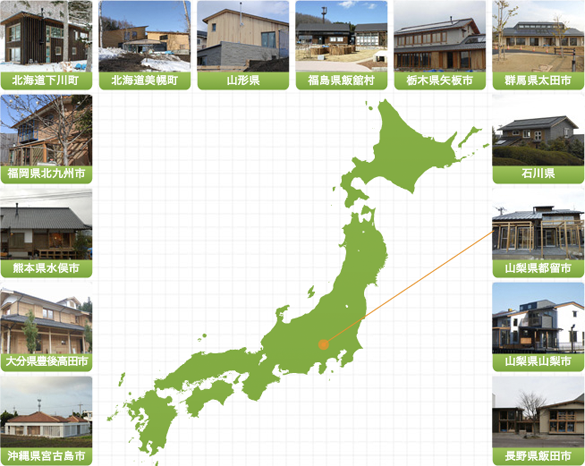 While most of the eco-houses are built in rural locations, 80% of Japanese are city dwellers. None of these ‘eco-houses’ was built in Tokyo despite the fact that 10% of the population lives in this, the world’s largest city. Many Japanese live in concrete apartment blocks. 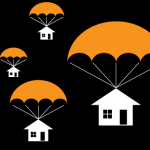 To be effective the program should next tackle urban housing and the unique environmental challenges it poses. Why are all the houses so large? The average Japanese home is a mere 95m2. Most of the model eco-houses seem to be considerably larger (in fact, many appear to be as much as double that in size). Some of the projects resemble community centers in layout and design, questioning whether local governments realistically intended to use the buildings as homes. Who actually lives in these homes? Most importantly: how much did it cost? This is where the program falls short of achieving its goal. Cost data is conspicuously absent from the website. 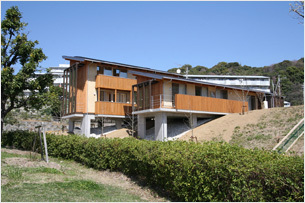 The government has supplied generous budgets for building each eco-house. Some architects, like myself, are eager to build sustainable houses in Japan, but in the real world, limited budgets don’t stretch much when it comes to the additional initial expenditure for the higher specification. Government subsidies for sustainable homes are still very limited in Japan and tend to reward technological solutions (marketed by Japanese electronics manufacturers). 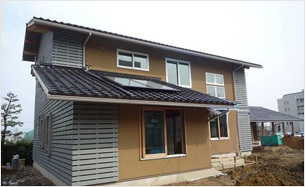 If the Japanese government is serious about building eco-friendly houses, offering incentives for practical sustainable design is the only way forward. 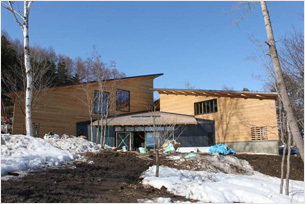 The Model Eco-House program demonstrates best practice in this field, so let’s hope Japan’s politicians and bureaucrats are listening. 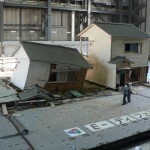 Should Foreign Builders be Allowed into Tohoku?